Like many, we were aware of the existence of this musical which has quickly established itself with a cult following - if not always combined with commercial success. And while we knew a little of its 'controversial' plot, neither of us had heard any of its musical numbers. We went into the show looking for a bit of a lift in tempo after a couple of serious plays and it didn't disappoint. 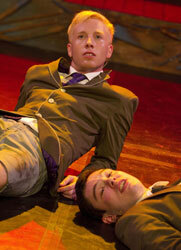 "Spring Awakening" is every bit a modern musical, despite its source material dating from 1891. Teenagers are teenagers, regardless of their place in time, and Steven Sater's book and lyrics use the language of today to express their shared angst. As a result, this makes some of the language a little...shall we say..'robust'. When combined with Duncan Sheik's music we get something reminiscent of 'Girls Aloud' or the latest flavour of Boy Band. But despite that, there are several songs that made sufficient impression on me that I'll be hitting iTunes or Amazon later to buy the Broadway cast soundtrack. RSAMD's One Academy have put together a show with high production values - large cast, live musicians and considerable effort put in to costumes and choreography. The cast perform the musical numbers well, but with the majority being of the pop/rock variety and the venue's less than ideal acoustics there's little scope to really blow the audience away with stunning vocals. But what does that matter when you can generate an intense enthusiasm in the audience for the performances with sheer energy? I can't say that there was a widespread standing ovation given at the curtain call but there were certainly a good number on their feet. I think it's pretty clear that this is going to be one of the hits of the Fringe, so don't delay booking (but do be careful you don't confuse it with the original play which is also being staged at this year's Fringe). I saw the RSAMD's production of the musical and Kudo's version of the play at the fring this year. The productions were obviously very different but I thoroughly enjoyed both and got a lot of insight and inspiration. The theatre company I'm part of (No nonsense productions) are performing Spring Awakening (the musical) at the Mitchell theatre, Glasgow from the 7th - 9th October. Tickets are £12 and are available from Julie on 07920408613 or www.nononsenseproductions.co.uk.